Casa Gonzalez, a lovely little delicatessen, is one of Madrid’s delightful-looking places whose windows you can hardly resist pressing your nose against, so inviting does it look inside with its wine and colourful cans lined up on shelves, and its large deli counter overflowing with delectable-looking goodies. It was opened in 1931 by a head employee of another of my spots (La Mallorquina in Plaza del Sol) when he decided he was ready to run his own place. Despite being on the losing side during the Spanish Civil War, Casa Gonzalez managed to survive and went on to be purveyors of fine foods and wines to Madrid’s high society. This is the place to enjoy some great Spanish wine, which at 2.20 – 3.50 euros per glass is really moderately priced. 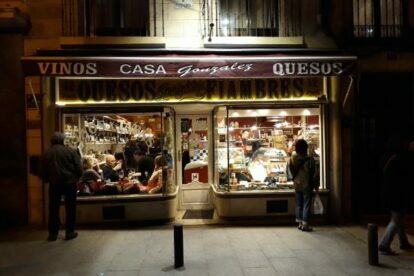 Their specialty is cheese and cured meats — I recommend having a mixed plate of Spanish cheese – if you are not sure which 5 cheeses to select, they are more than happy to make suggestions. My favourite is the “azul picón de hojas”, which is a tangy blue cheese from Asturias, made from goat, sheep and cows’ milk, wrapped in vine leaves and cured in caves. They have good salads and some more substantial hot dishes as well as a fab selection of “tostas”; who doesn’t enjoy things on toast! So please, don’t just gaze in longingly – go in and enjoy!